My favorite side dish to make when grilling in the summertime is macaroni salad. I especially love serving this with Alsatian sausage from Dziuk’s Meat Market. I make this recipe quite often because it is just so good and really easy to put together. It amazes me that something so simple can really impress people. People have told me on several occasions this is the best macaroni salad they have ever had even though they don’t like macaroni salad. Mention this macaroni salad around my husband and his eyes will light up. I got this recipe from my mom who helped put together a cookbook as a fundraiser for the St. Louis Catholic School in my hometown. 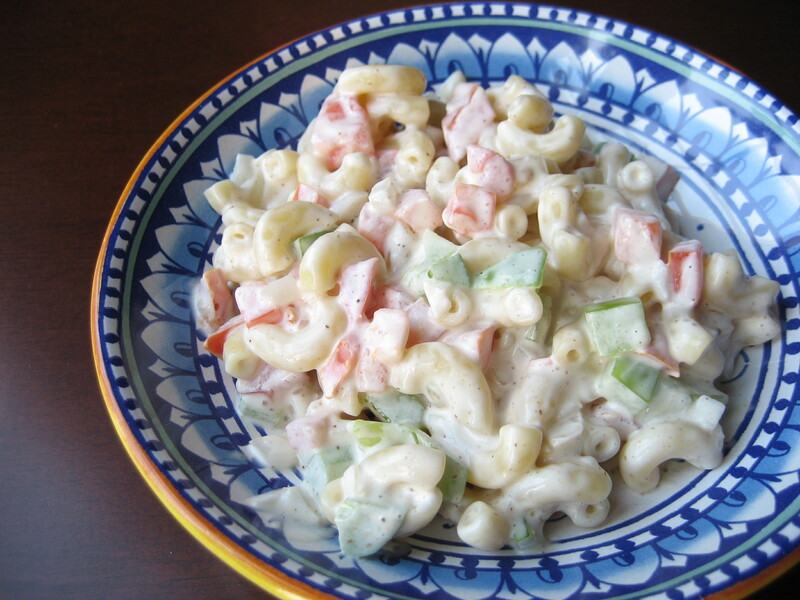 There were several macaroni salad recipes submitted and printed for the cookbook, but the one submitted by Beverly Keller is hands-down the best. It has to be the celery salt that makes it so good. If you are having a backyard bash to celebrate the upcoming Labor Day weekend, I would absolutely add this dish to your spread. I recommend experimenting with less mayonnaise and salt to reduce calories, cholesterol, and sodium. You might find that you won’t need as much as the recipe calls for and it will still taste good. Oh, and a note about the mayonnaise: please only use Duke’s, Hellman’s, or even homemade. Trust me on this, there is a difference. The other mayonnaise brands will give you a dry macaroni salad. What is your favorite dish to make when you grill in the summertime? Cook pasta according to package directions until al dente. Drain, rinse with cool water and drain completely. Immediately stir in the onion and bell pepper while the pasta is still warm. Add the tomato, salt, celery salt, black pepper and mayonnaise. Stir until well blended. Chill and serve. Can be made ahead of time and refrigerated overnight. Best when used within three days. Makes 5 to 6 cups. Beverly thank you a million for sharing this recipe I have tried in vain for quite awhile now to get it, your a jewel. Hi Brenda! I’m not Beverly. I put her name in the title to give her credit for the recipe. I’m glad I could help you finally get her recipe though. It really is delicious!